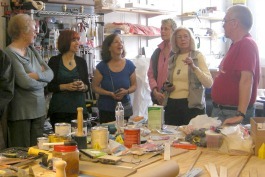 On October 5–6, artists at the Essex Studios in Walnut Hills will open their workshops to the public for an Art Walk. Visitors can explore three floors of artwork, sample refreshments, hear live musicians, and browse and purchase guest artists’ work on display. The 100 artists at the Essex work in every medium, including oil, watercolor, encaustics, mosaics, pastels, photography, sculpture, glass, wood, metal, ceramics, textiles, jewelry, and printing. The Essex is also home to the community education classes of the Art Academy of Cincinnati, a dojo (martial arts) studio, musicians, an actors’ studio, the Lucky Cat Museum, the Touch of Heaven Massage Salon, and even a basement gym. The building has a history of spawning creativity. In 1913 the 150,000 square foot edifice was built as a plant for the Herschede Hall Clock Company. In the late 1950s, the structure was purchased by the Hamilton Tailoring Company, which continues to make custom suits and uniforms. Currently, Trent Heimann, the tailoring company’s fourth generation heir, owns the Essex. As you enter the Essex Studios, one of the first spaces you encounter is Studio 133, the domain of Robert McFate, who describes his style as “outsider art.” McFate specializes in using natural and found materials, and his work includes whimsical flowers painted on barn tin, character portraits made of metal found on the street, child-inspired art painted on repurposed wood, and assemblages. Essex artists admire Glen Carley's woodwork. In Studio 162, custom woodworker Glen Carley of Wooden It Be Nice crafts beautiful pieces commissioned by restaurants and other clients such as tables, benches, bookshelves, lidded boxes, picture frames, serving boards, bowls, plates, and artist tools. He also crafts unique wooden toys and does woodcarving. Studio 122 houses the 11-member Art Circle, a group of watercolor artists who meet weekly to mingle and paint. The group has had numerous exhibitions throughout Cincinnati, including at City Hall, Christ Church Cathedral Gallery, and Interact for Health, and members have collaborated on group projects such as the popular “DELICIOUS: The Art of Food” recipe gift set illustrated with original artwork of edibles. On the second floor, in Studio 247, painter Gilda Horn paints true-to-life oil portraits as well as vibrant landscapes, flowers, and still lifes. People, pets, and landscapes are the subjects of her commissioned pieces. She also holds private and semi-private art classes for adults and children in her studio. Maya Drozdz, marketing manager for the Walnut Hills Business District, praises the Essex Studios as a great value to the community, with the presence of such a wide range of artists and creatives at the Essex adding an “artsy swagger” to the mix of businesses in Walnut Hills. The Essex Studios is located at 2511 Essex Place, between Taft and McMillan streets. Parking and admission are free. For more information, visit the Essex Studios website.